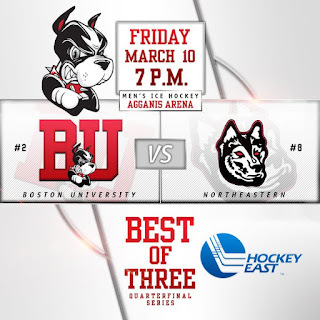 After a bye week in the first round of the Hockey East tournament, BU will host cross-town rival Northeastern in the quarterfinals. The Huskies advanced by sweeping Connecticut with 3-1 and 5-1 victories. The best-of-three series begins Friday at Agganis Arena with puck drop at 7 p.m. Game 2 of the series on Saturday night will air live on NESN and on the American Sports Network in national outlets. ►Terriers dropped one notch to #8 in the USCHO weekly poll, but moved up one spot to #6 in the USA Today/USA Hockey Magazine poll. For the third time in recent weeks, BU has received a verbal commitment for its 2020 recruit class. 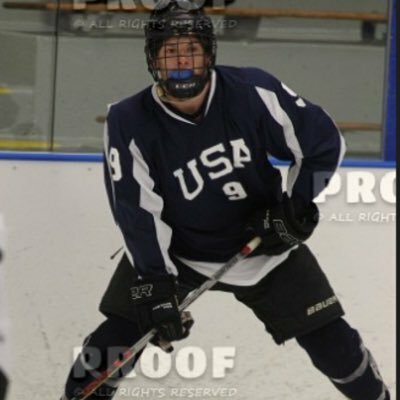 Over the weekend, St. Sebastian’s freshman right wing Liam Connors gave his commitment to BU. Skating on the Arrows' top line, the 5-8, 155 forward produced 15 goals and 13 assists in 29 games, helping St. Sebastian’s reach the semifinals of the NEPSIHA Large School tournament. 6. 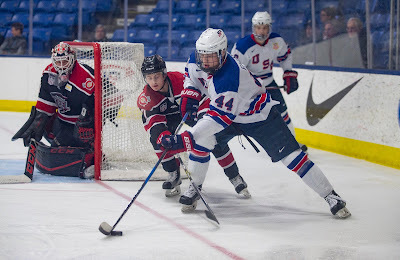 Liam Connors, #12 St. Sebastian’s, Fr., Right Wing, Shoots Right, 2/1/01, 5-8/150 - He's an undersized forward who is quick, slippery and crafty. His speed is dynamic enough that he can blow by defenders to the outside. He has a great motor and when he's at his best, his feet never stop moving. His speed and quickness make him a threat in prep, but his size is what keeps him outside the top five on this list. He has a very good offensive skill set and a high compete level. His feet are always moving. 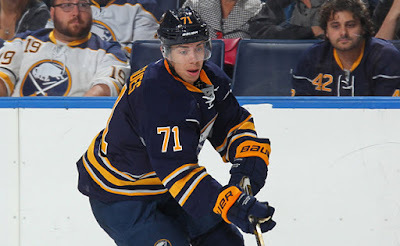 He is slick with the puck and can make plays in traffic because of his hands and agility, despite his lack of size. He made one move that left the crowd gasping after he split two defenders and got off a backhander that was saved. A product of the Middlesex Flames organization, Connors played elite midget hockey last fall for the Neponset Valley River Rats 16Us, generating 18 points in 13 games. The Westborough, Massachusetts native played in last summer’s USA Hockey Select 15 Camp and recently was drafted by the Junior Bruins for the new National Collegiate Development Conference of the USPHL. Jack Eichel’s 18th goal gave Buffalo a three-goal lead Sunday night, but Pittsburgh roared back to win 4-3. The tally, the 40th of his career, extended his scoring streak to a career best 10. Nick Bonino assisted on the game-tying goal for the Penguins.